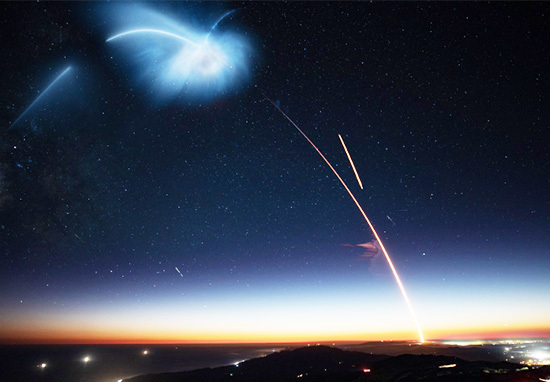 A rocket in LA created such an impressive show by lighting up the night sky that people had to be reassured there wasn’t an alien invasion happening. The SpaceX rocket ‘Falcon 9’ was launched into the stars on Sunday (October 7) from California’s Vandenberg Air Force Base, on a mission to deliver an Earth-observation radar satellite into orbit for Argentina’s national space agency. The rocket carved an incredible line of light into the sky, turning from firey orange to blue as its two stages separated. Disney Feature Animation artist Joaquin Baldwin headed up into the hills to make sure he got the best view of the rocket’s launch. Up on the Santa Ynez peak, ready to shoot the @SpaceX Falcon 9 rocket launch of the SAOCOM 1A. Full precautions taken, no bird will dare land on my head now. THAT WAS AMAZING! The @SpaceX launch from Vandenberg was incredible! I took one long photo, 9 minutes long, the stage 2 cloud was spiraling out of control, what a show! Surreal doesn’t begin to describe it. A bloody meteor exploded into a cyan and magenta nebula, which stared at us with hypnotic, spiral eyes, before vanishing into a comet. Falcon 9 managed to successfully deliver the satellite, and also made history by landing the first stage of the rocket at a new site called Landing Zone 4, near its Vandenberg launchpad. This will be SpaceX’s first land landing attempt at Vandenberg Air Force Base. Local residents may see the first stage of the Falcon 9 returning to Vandenberg AFB, including multiple engine burns associated with the landing. During the landing attempt residents from Santa Barbara, Ventura and San Luis Obispo counties may hear one or more sonic booms. Lovely @SpaceX launch from Vandenberg AFB as seen from my backyard in Montrose, CA.